I was on Delta Airlines Flight 1667 flying from Atlanta, GA, to Myrtle Beach, S.C. 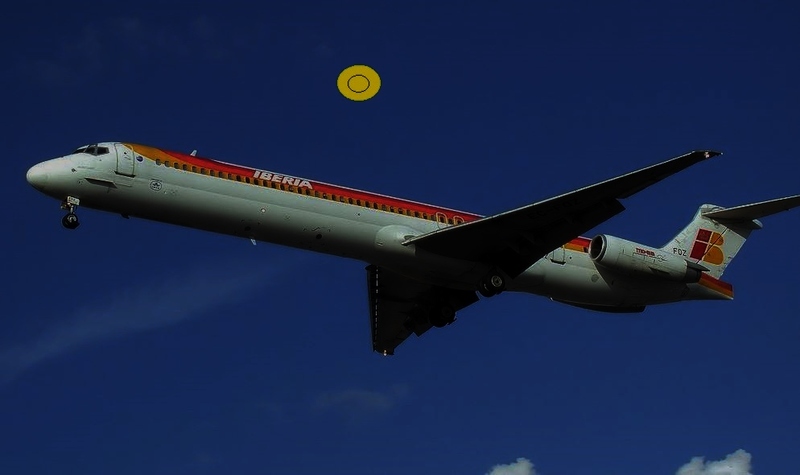 The aircraft was a MD-88 and I was sitting in seat 19E on the starboard side of the aircraft, several rows forward of the wing, which I could see on the right side of my window when I leaned forward. We took off an hour late at around 22:29. There was an overcast of Cirrus-stratus or Alto-stratus clouds. The full moon was not visible through this layer. There were no lower clouds and city lights were plainly visible without obstruction during the initial climb out after takeoff. There were no reading lights in use near me. There were also no electronics in use with illuminated screens nearby that would have reflected on the inside of the window. Shortly after takeoff the aircraft leveled out and the lights of the city were plainly visible with a definite darker area extending out to the horizon visible under a slightly lighter sky over that. At this point I was looking down at the city lights, when I noticed a light separate itself from the rest and begin to move. It was a banana yellow color and was moving upward at a slow and steady pace. There were no other details to it. I could not judge its distance from us. As it moved, it appeared to be heading on an opposite course to ours and was climbing at an angle of approximately forty five degrees. From my perspective it moved from the lower left of the window to its upper right corner where I lost it to view. The light became obscured by the leading edge of the wing and then reappeared over the rear upper edge of the wing or wingtip. All this time which was probably a minute or so the light did not change in brightness or flicker. The color stayed the sa! me and so did its speed of ascent. I was unable to observe the object further as it went out of my limited field of view even by shifting my position. I don’t know if anyone else on the aircraft saw this. During the initial takeoff before we leveled out there were other aircraft visible. This light or object did not exhibit their characteristics. I have flown numerous times at night and have seen plenty of aircraft leaving or arriving at airports. This was not one of them. Its apparent point of origin was not from any airport. It was an urban environment. Shortly after this we began to ascend again and banked for a course change. I checked my watch and it was now 22:35. I am sixty two years old, male, and was travelling alone returning home from a family related trip. I am a retired social worker and business manager. I am an amateur astronomer and avid sky watcher. I have no clue what this was. I only know what it wasn’t. I considered raising this issue with the pilot upon landing at Myrtle Beach, but decided to avoid that and take this approach instead. I don’t know how he would have reacted, but I did speak with him about the natural fireworks of distant thunderstorms visible to our south during the flight at higher altitude which he was also quite enthusiastic about. NOTE: The above image is a rendering.